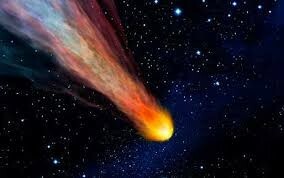 Meteor- a small body of matter from outer space that enters the earth's atmosphere, becoming incandescent as a result of friction and appearing as a streak of light. Meteroroid is a piece of interplanetary matter that is smaller than a kilometer and frequently only millimeters in size. Meteorites are very small, their size can range from about a fraction of a gram (the size of a pebble) to 100 kilograms (220 lbs) or more (the size of a huge, life-destroying boulder). 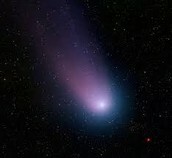 Comets- a celestial object consisting of a nucleus of ice and dust and, when near the sun, a “tail” of gas and dust particles pointing away from the sun. from the giant cloud of gas and dust that condensed to create the sun, planets, and moons some 4.5 billion years ago. Today, most asteroids orbit the sun in a tightly packed belt located between Mars and Jupiter. Ceres, 4 Vesta, 2 Pallas, and 10 Hygiea. 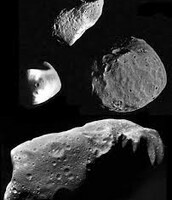 Asteroids- small rocky body orbiting the sun. 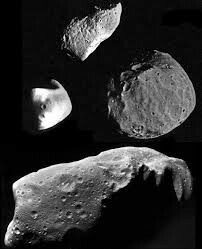 Large numbers of these, ranging in size from nearly 600 miles (1,000 km) across to dust particles, are best found between the orbits of Mars and Jupiter, though some have more eccentric orbits, and a few pass close to the earth or enter the atmosphere as meteors.